The leaves were turning gold and amber, falling from the branches they grew from, making a carpet for the woodlands. The air was still warm, and the sun was bright as ever. A Minun was sitting up in a tree that still had most of its leaves, away from the eyes of any Pokemon aiming to hunt him. He got there by jumping up from lower branches of adjacent trees, finally making it here. A river flowed not too far away. Inside it, a Quagsire lay in wait for it's prey. Minun smiles a bit, watching. A group of Wishiwashi sped downstream, but three weren't paying enough attention and flew into the Quagsire's mouth. Minun sighs and jumped down from the tree. Watching the Quagsire get his meal was making him hungry. Minun slowly approached the river and caught sight of another coming group of Wishiwashi. Minun breathed as slowly as possible, dived down, and tried to catch one in his mouth, but all the nearest ones dodged him. Minun's tail gave an agitated twitch, and he tried again, met with another failiure. Minun was about to give up, but in moments, he convinced himself at one last try. He dived forward to catch one of the fish Pokemon, and fell into the river. He made it out, however, with a Wishiwashi squirming in his mouth. Minun held it in his arms and thought to himself, 'Never had these before, but I haven't found any berries for ages, I might as well..."
After his meal, Minun was laying down, waiting for it to digest enough for him to not feel a stomachache every time he moved. He couldn't help but smile. Life out here is good. A shame it wouldn't last that long. Minun was walking alongside the river, minding his buisness, when all of a sudden he heard someone calling for him. "You! Minun! Stop! I need to talk to you!" He turned around to see an Espeon running towards him. She was wearing somewhat tight looking 'anklets' around all four paws as well and a similar 'necklace'. It had alternating Unfezant tail feathers and Chatot wing feathers. Minun smiled. It was the forest's Prophet. She stopped in front of him, panting. When she caught her breath, she said, "Come along, Minun. We really need to talk." Prophet had led Minun to a cave within a small hill. It was filled with beautiful crystals of many kinds and colours, and at the end was a pool of water, and on the wall was a jewel carving of Xerneas in an extremely noble pose. The jewels shone pink, blue, and gold. Prophet sat by the pool and guestured for him to come forward to the pool. "As you know, we have three leaders, each gaining their leadership in one of three ways." Prophet moved her paw along the pool, and a shining image appeared of a Stantler looking over the top of a cliff. "Stantler, elected by the vote of the Pokemon of the Forest of Xerneas." She moved the pool's water again, changing the image to a beautiful Tsareena. She appeared to be congratulating a Leafeon on their newborn. "Tsareena, having gained her leadership by family right." Prophet changed the image to a Nidoking fighting off a hoard of Pokemon appearing to be floating rags with faces. "What are those things?" Minun asked. "They are called Shuppet. They're from the Desert of Volcanion." Prophet said. "Huh. Never seen those before." Minun said. Prophet smiles a bit. "That's good. Anyway, Nidoking gained his role by climbing to the top rank of our Centaurion Guard." Prophet's face fell. She seemed rather unhappy. Minun shuffled forwards a bit. "What's wrong, Your Grace?" The Psychic type looked up, tears in her eyes. "The Forest is in grave danger." Minun felt like his heart stopped for a moment, and he fell silent. "Allow me to explain..." Prophet said. "Like us, an area known as the Peaks of Zapdos have three leaders, but unlike us, one has gained complete control by fear. Even the other two leaders fear him. These 'other two' are..." She swiped at the pool, showing a strange winged creature flying over the cloudy skies. "Swoobat, having been elected by those of the peaks." She swiped again, now showing a reptilian creature hiding in a cave, looking gloomy. "Scrafty, gaining his lead by family right." And then tears began falling down her face. "Who... who's the third leader? The bad one?" Minun said, his voice shaking. Prophet looked up and whimpered, "My brother... he left me for them and now he's become a monster..." She swiped the pool, showing the biggest Jolteon he's ever seen. 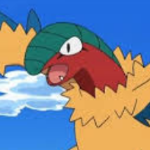 The Electric-type Pokemon looked over his shoulder at a brown bird Pokemon across the room he was in. "Staravia! Bring one of..." Jolteon chuckled, "Them... forth...." Staravia shuddered and chirped, "Yes, sire!" and flew off. Staravia returned with a brown and yellow Shiinotic. Minun gasped. This Pokemon was a centaurion... and his best friend. Jolteon laughed, sparking with electricity, charging forward. Shiinotic prepared to battle, but he quickly realized he'd never win. Then the pool went blank. Minun shuddered. Jolteon had taken his friend away. He couldn't let that monster get away with it. He can't let Jolteon do this to anyone else. Tears fell down his face. "I have to stop him." Prophet sighed. "You can't do this alone, Minun..."
Minun was now sitting near the mouth of the cave, watching. Prophet was repeating the information she gave to him, but now she spoke with a Magikarp, who was in a large rock 'bowl' of water to keep him from getting dehydrated, or so he claimed so intensely, making Minun assume it wasn't as neccecary as Magikap says. Alongside the fish was a Mightyena. Minun couldn't help but feel awful as they recoiled at the visions the Espeon revealed to them, even bringing Mightyena to tears. He hated that he had to shatter the hearts of two trusted Pokemon in order for them to understand what the quest had to offer. They had to trek into the vile mountain range where family and friends of the three were captured and stop Jolteon's rule over the Peaks, and to add pressure, faliure may lead to the fall of the Forest of Xerneas. Before they went off, Prophet gave them a bag with five crystals, each with a different colour. Mightyena blinked. "Are these bits of those Z-Crystal things?" Prophet laughs weakly. "No, no. They are called Power Gems. Humans have never discovered them. They are the most closely-guarded secret we have. When the time comes, you will know how to use them. Once you use a crystal once, it is yours, and nobody else can use that gem. I added two extra just in case you find anyone that can help you." Minun took the bag. "Thank you, Your Grace, but how will we get in without causing alarm?" Prophet smiles, "I have gotten one of our mechanics to make a flying contraption that will make sure nobody will know you three are inside. Come along." And when they went outside, they saw a group of Quagsire pushing the biggest Hydreigon he's ever seen. In reality, it was a decoy. "Inside, you can operate it if you all work together, one steers, one gives directions, one keeps watch." "I call giving directions!" Mightyena calls. They laugh, give their farewells, and take off, Minun steering and Magikarp keeping watch, since he couldn't exactly steer, and Mightyena already decided to give directions. The false Hydreigon soared over the Peaks sky. Magikarp, on a wheeled stool carrying his rock bowl, 'drove' about, keeping an eye out for almost everything. Minun turned whenever Mightyena called for it. Things were simple. Soon, however, Magikarp got bored. Nothing to be seen. Mightyena grew tired, somehow. Minun, howver, could barely stand to move the steering wheel. "We... We should land..." Mightyena huffed before collapsing into a nap. When Mightyena finally woke up, everyone was very, very hungry. Mightyena agreed to get something, and sneaked out of the dragon-like ship. Magikarp blinked. "Is she goin' to be ok?" Minun gulped. Just hearing the red fish pokemon's concern made Minun afraid. This is enemy territory. Prophet's own brother is planning to overthrow and destroy the land he once called home. And even though he was part of the cause to save the Forest, he felt completely powerless. Mightyena returned with a large number of Crabrawler. "Seafood, anyone?" She said smoothly. Magikarp looked a little disturbed by the canine's word choice, but was content with eating what she had brought anyway. Besides, it was just a dark sense of humour. They had made it through at least half of the Crabrawler until Minun was stuffed, Mightyena was contently full, and Magikarp couldn't even move. They decided to keep what was left for next time, since the first half was so filling, they could certainly keep the other half for their next meal. Magikarp looked out, at the assistance of Mightyena, and saw an enormous group of Fomantis. Many had already noticed the Hydreigon was fake, and the information moved fast. Minun's heart fell to his feet. One called, "Someone get High Centaurion Beheeyem!" Everyone exchanged glances. "Uh oh." Mightyena shuddered, and then dashed for the bag of Power Gems. Minun yelped, "What are you doing?!" Mightyena growls in reply, "I don't know. Just feels right. Mag! Watch the 'dreigon!" and dashed out. Minun followed close behind. When they got out, they saw that the High Centaurion was significantly taller than expected. He laughed, then blasted Psybeam. Minun and Mightyena leaped away, and Mightyena threw the Power Gem she grabbed upward, allowing it to glow a pale, snotty green. The Gem landed just millimeters above her nose, and suddenly, for only a moment, the cliff was washed over with green light. When Minun looked at his friend again, she looked different... kind of like a bug. She had massive mandibles coming from her mouth, eyes that appeared to have one million lenses, six thin legs, a segmented body, and antennae like a Beedrill. Minun felt a little creeped out, but now he knew what the Gems did. Mightyena rushed forward, snapping her new mandibles onto Beheeyem's arm. the Psychic type howled in agony. Minun rushed forward as well, sending off an Electro Ball, which missed Beheeyem, but landed in a massive cluster of Fomantis. The battle rages on and on for hours, but finally, Beheeyem was on the ground, weakly shrieking of vengance as the remaining Fomantis carried him off. Mightyena pulled off the Gem, reverting back to normal, before reentering the fake Hydreigon. Magikarp splashed around exitedly, clearly having watched from the saftey of the vessel. "That was awesome!" Magikarp yelled over and over until Mightyena slapped him for silence. Minun sighed. "This isn't our last fight here. We have to keep going forward. We have one chance. Just one chance. We can save the Forest if we keep heading forward." Night fell, and as pokemon flew past, Minun, Magikarp, and Mightyena were happily sitting around eating some of their Crabrawler, which they decided to eat less of since they took flight again, to save for later. "We have to be a lot more careful than I thought. I saw one Hydreigon land, and Fomantis hoardes all just... All just..." The water-type didn't need to finish. Minun was terrified. All that just to get rid of them? Now they really need to be careful. One mistake and the Forset is set to doom.